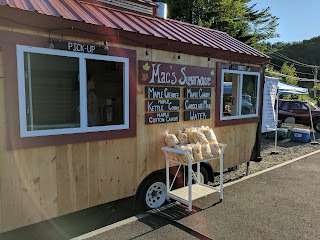 I discovered the existence of Mac's Maple soft serve creamees last summer when I visited my family in New Hampshire. I adored it, but was only able to get in one visit, as I was in town a short time, and the available hours are quite limited. The farm has a little shop open only on weekends that sells the creamees, or you can find the creamee trailer around town at events (like fairs, and ball games, which is where I sought it out last time, yes, actually going to a ball game not to see the game at all). 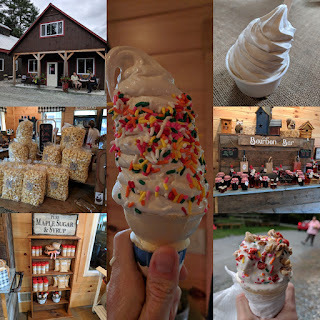 When I returned to visit this year, I was determined to get it again, but it was late August, the sports season had ended, leaving weekends only, at the farm, as the only place to get creamees. I was there for one weekend. My mom had a big family bbq planned for one day. Yes, I had exactly one day when they were open, and, even though it was not ice cream weather (cool and stormy), I sought it out. 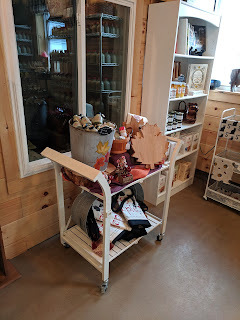 My visit was to the farm, where I was able to check out the cute shop with assorted other maple inspired and local items for sale, plus, well, get my creamee. And this time I went prepared, with my own toppings, since I knew they only offered sprinkles. It was a great success. 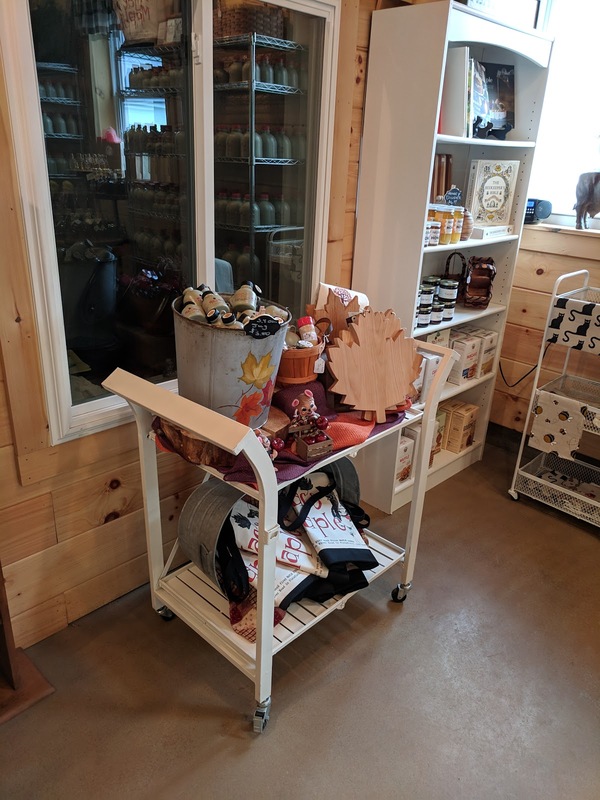 Located right on the farm, they have a small storefront, mostly a retail location for their maple syrup (as Mac's Maple is a syrup business after all!). It is quite cute, farm style obviously, a few small tables outside at which to eat your goodies. They sell much more than just syrup inside, although, of course, you can get that. The maple sugar had this before (Santa clearly shopped here when doing stocking stuffers one year). Basically just maple-y sugar, a bit more fun to use than brown sugar as a topping on oatmeal and the like. You can also buy larger quantities for use in baking. "100% pure wood fired maple syrup aged in a Bourbon Barrel." 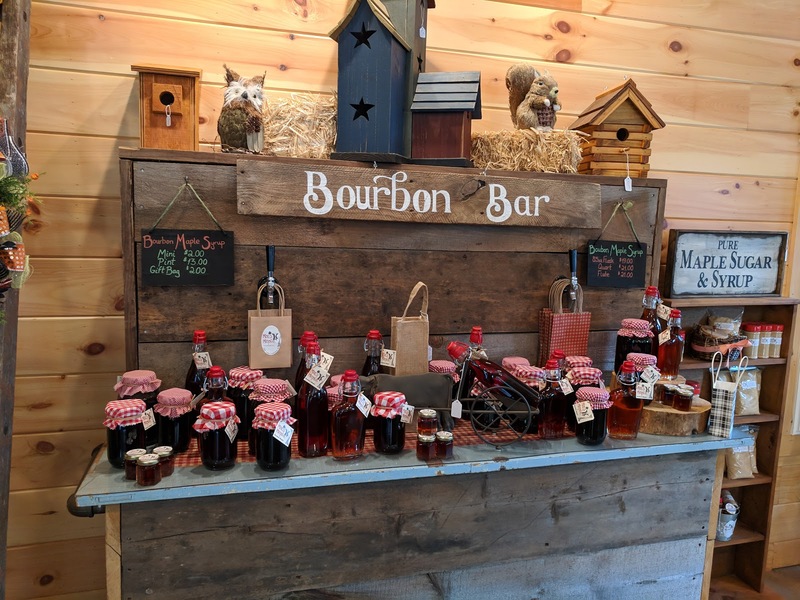 In addition to regular maple syrup, they also make a bourbon maple syrup (aged in a bourbon barrel, it isn't actually made with bourbon). The packaging, displays, everything about this was adorable. They also had samples of the bourbon maple syrup, and I tried it. 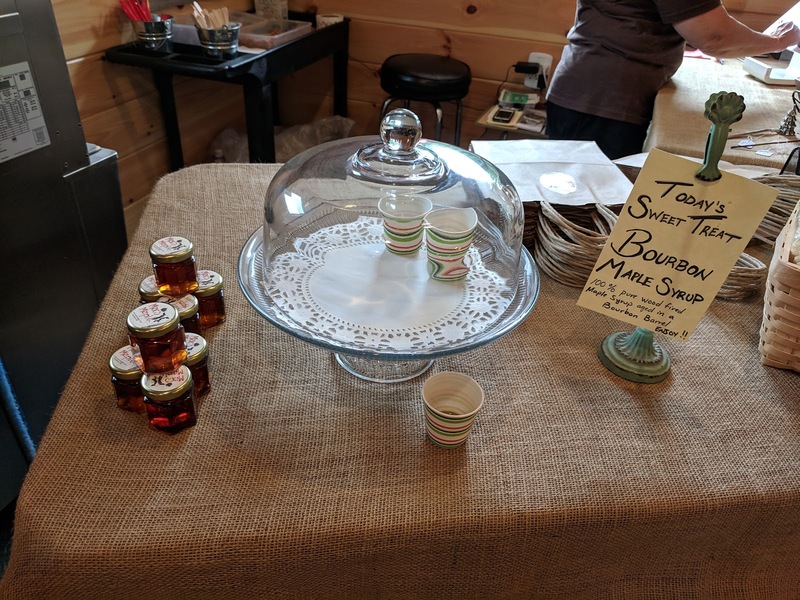 I didn't really taste anything particularly special, but it was sweet and tasty, and my mom enjoyed pouring it over her creamee for even more maple flavor. They also had a large selection of gift baskets, filled with syrups, sugars, t-shirts, and even house made maple cotton candy (which is also for sale separately). 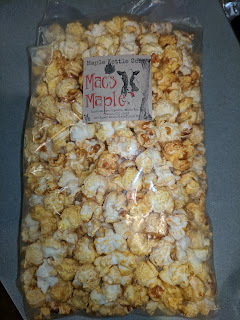 And of course, bags of their maple kettle corn in assorted sizes, which I had picked up from the trailer at the ballgame last time too. And of course I grabbed a bag of that to take back to my parent's house, vacuum seal, and bring back West with me. 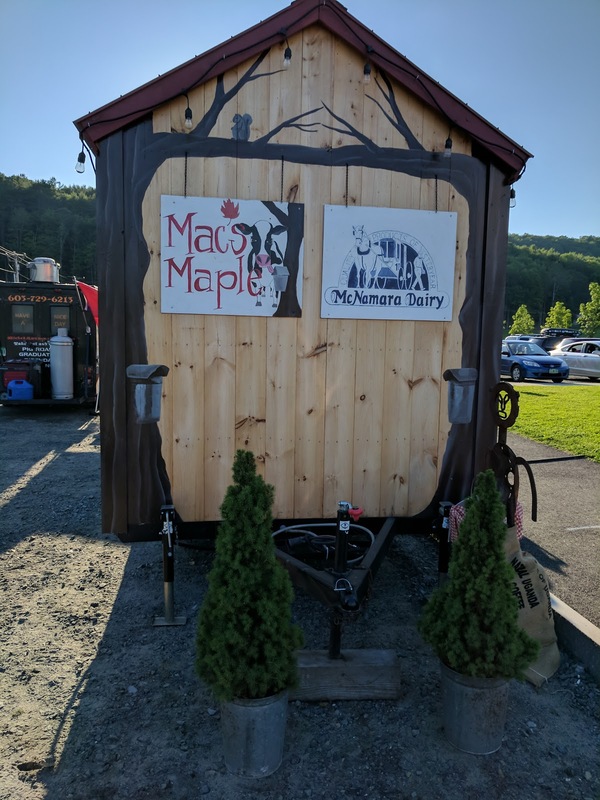 If you don't recall, Mac's Maple is the sugarhouse associated with the McNamara Dairy, a local dairy farm, so of course they had the milk, chocolate milk, butter, maple butter, and cream available to purchase, along with farm fresh eggs and bottles of water. I know their milk well, as we sometimes got it as a splurge when I was growing up, particularly the chocolate milk, or, seasonal eggnog. It is sold at most of the grocery stores in town. The freezer cooler had other cow products ... yup, ground beef, steaks, and kabobs, plus their own smoked applewood maple bacon. And ... ice cream. Quarts of vanilla and chocolate hard serve from the McNamara Dairy, but also, packaged creamee pints, although of course the texture would change considerably for soft serve that is packaged and frozen. Still, better than nothing! And their incredible sounding Maple Creamee Pie, with waffle cone crust, and optional maple candy topping. I was a bit sad that they had them, actually, because I had wanted to surprise my mom with one of these some day for Mother's Day (I thought they were a Mother's Day only thing, and had tried to get one to her last year, but couldn't find someone to pick it up for me, as the location isn't exactly convenient, way out on the farm). But we were there for one main reason: creamees! 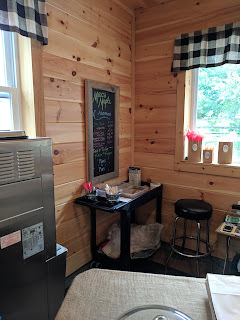 The creamee machine is located behind the register, with a chalkboard sign listing the offerings. The options are extremely limited. Creamees come in one size only, no option for a kiddie size. It is a generous serve, so I'm not sure what you'd really do for a child. 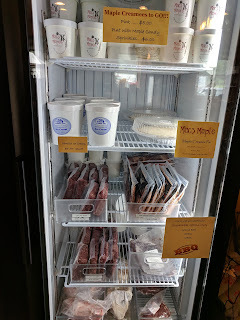 You can get it in a cup, a regular cake cone (Joy brand, gluten-free available), or waffle cone ($2 extra). With maple candy or rainbow sprinkles ($0.50). And that's it. I'm surprised Mac's Maple doesn't offer the maple syrup drizzle as a topping option, who wouldn't want more maple flavor? 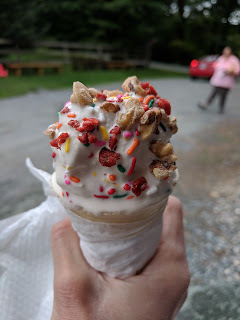 I came prepared with my own toppings, but was glad to see they had rainbow sprinkles here (the trailer had only the maple candies when I visited before, which were good, but just too sweet for me on the ice cream). My mother went simple. A creamee, in a dish. Of course, she knew I brought toppings to add, and opted for some of the crushed walnuts I brought along, and drizzled hers with her bourbon maple syrup sample, creating quite a nice little sundae for herself. 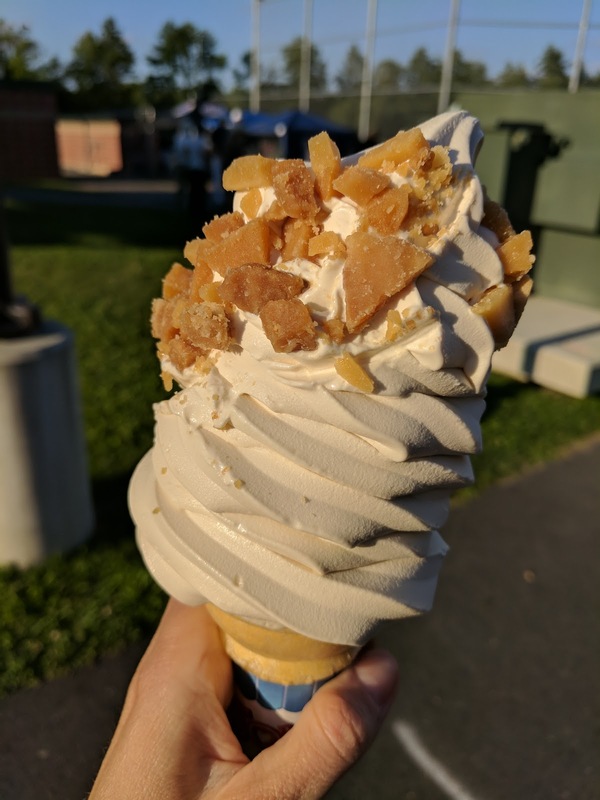 She enjoyed it very much, saying it really just was the best maple soft serve she's ever had, the best soft serve in general in town, but not somewhere she can easily stop by, so, Dairy Twirl remains her regular place. 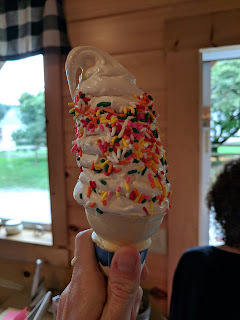 The $3 price is entirely reasonable for a large serve, of ice cream made with quality dairy from their own creamery, and real maple syrup, when everywhere else in town carries "maple" flavored soft serve, made with fake syrups and powders, not the real thing, and generic dairy base. Maple Creamee Cone, with Rainbow Sprinkles. $3.50. I opted for cone (soft serve is all about the licking experience for me! ), with rainbow sprinkles, even though I had more toppings to add. I love my rainbow sprinkles for color and texture. 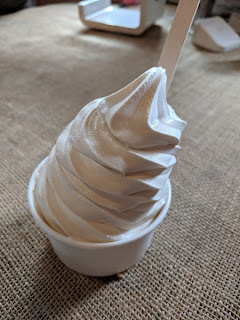 The soft serve was very good, a tiny bit softer than you'd necessarily want, but given that it wasn't hot, this was fine, and it did not melt too quickly. Very creamy, clearly quality rich base, and more maple flavored than any other soft serve maple I've ever had, because, well, it uses real syrup rather than sugar and artificial flavors. The difference is very obvious. This is very good soft serve. The sprinkle application left something to be desired, I thought because it was a bit soft they were worried to roll it in the sprinkles, and just spooned it on, kinda sorta covering some of the cone. I was pleased with the sprinkle quality, they weren't waxy as I've been finding Dairy Twirl's lately, but they weren't particularly special. But I had more toppings to add. 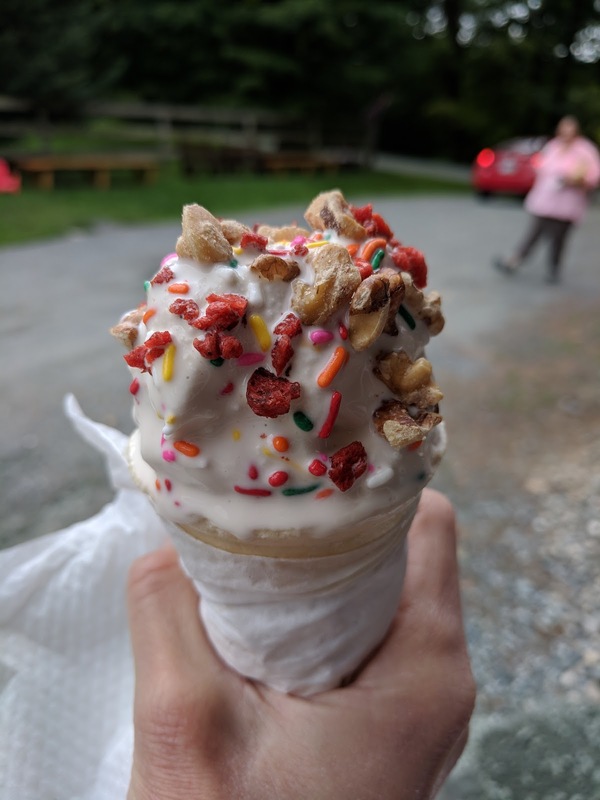 Maple Creamee with chopped walnuts, fake bacon bits, rainbow sprinkles. When I had Mac's Maple the first time, I wrote in my notes that I'd love to try it with crushed walnuts as a coating rather than the maple candies, and so I came prepared, with my own crushed toasted walnuts and candied walnuts. Oh, and fake bacon bits. Maple pecan, maple bacon, these are things others go for right? The walnuts were a nice touch, adding the texture I wanted, and even better on my mom's sundae with her drizzle of syrup. I suggested to Mac's Maple that they add walnuts to the topping lineup, but they didn't really want to go near nut allergies, which I can understand. If you like maple walnut, bring your own nuts! I also added bacon bits. Fake bacon bits. Because, well, I'm silly? Maple bacon, sure, that is a thing, but I didn't think real bacon bits would work well, as they are soft. I wanted the crunch of those fake bacon bits. They too were a fun topping, and I appreciated the salt level they added, and definitely the crunch. The texture, and salt level, were perfect. The flavor was ... fine, but not really something I'd do again, although I more blame the brand of "bacon" bits I had than the concept. So altogether, I had fun adding my toppings, appreciated the crunchy things, but the rainbow sprinkles really would have been fine. I'm glad they carry those now. Bear with me for some story time. I grew up in New Hampshire, in a fairly rural area. There was a dairy in town, that still sold milk in glass bottles at the supermarkets. But it was far more expensive than the regular milk, so it was something we only splurged on from time to time. Like when my mom REALLY wanted the chocolate milk, or eggnog, both which are amazing. And then we had to deal with bottle returns, which always seemed complicated. Those are my memories from childhood of the dairy. Anyway, that dairy, McNamara Dairy, is a place I've been aware of most of my life, really. 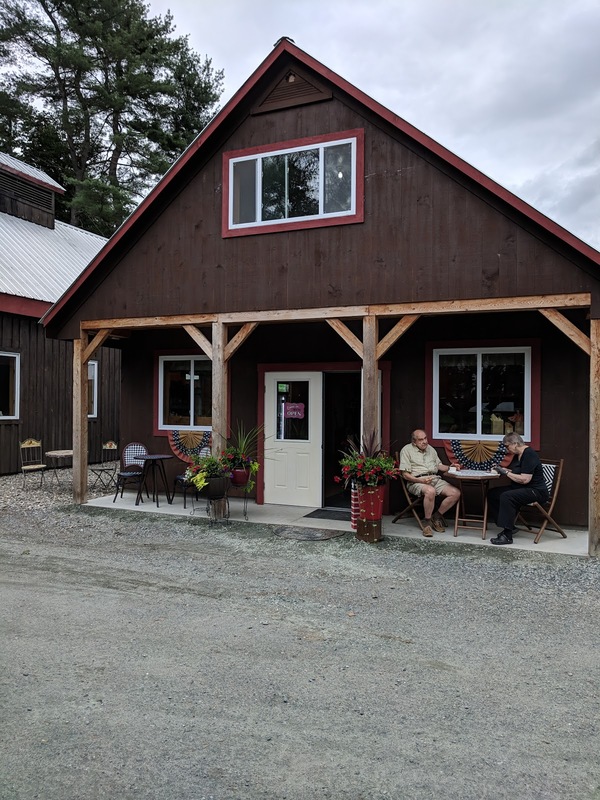 It is located on the outskirts of town, down the street from the farm where we always went strawberry picking. 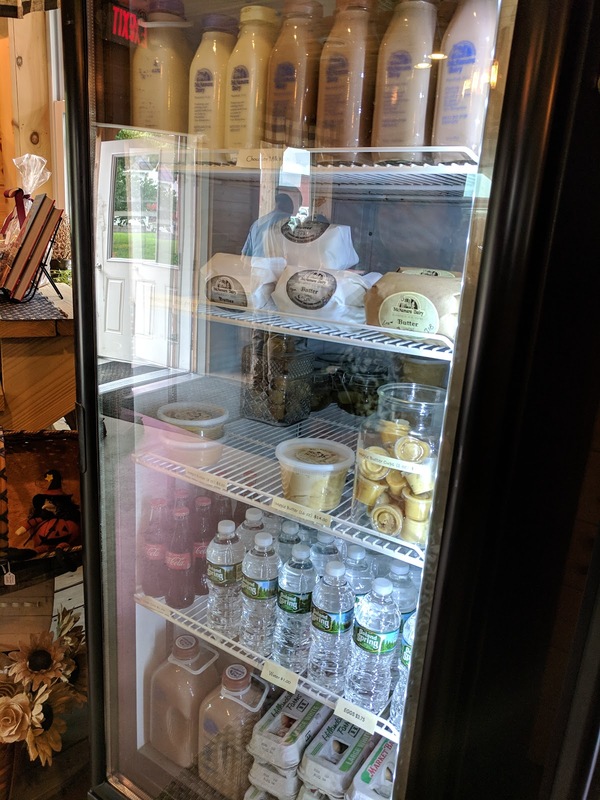 I've mentioned it before, like when I had eggnog whipped cream on my bread pudding at Lou's one time and it was made with McNamara Dairy eggnog, or when I reviewed my amazing experience at Home Hill Inn, which was located right down the street as well, and sourced all their dairy there as well. But it wasn't a staple of my life. Associated with the dairy is a sugarhouse, Mac's Maple. My godfather makes his own syrup, so, we never got maple syrup from elsewhere, although I tried the syrup from Mac's Maple when I went to brunch at Home Hill Inn as well. 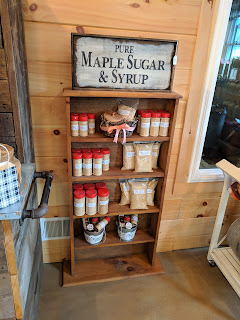 They also make maple sugar candy, so I'm pretty sure some of that must have shown up in my Christmas stocking at some point, I just don't recall. So where is this all going? To a great discovery I made in July 2017. The maple creamee. I'll back up a bit to admit that I did not know what a creamee was. Urban Dictionary tells me this is what Vermonters call their soft serve ice cream. I grew up in New Hampshire, not Vermont, but we are *right* on the state line. I spent a lot of time in Vermont. I've eaten an insane amount of soft serve ice cream. I had never heard this term until about a year or so ago. A maple creamee, then, is a soft serve ice cream, made with maple syrup instead of sugar. 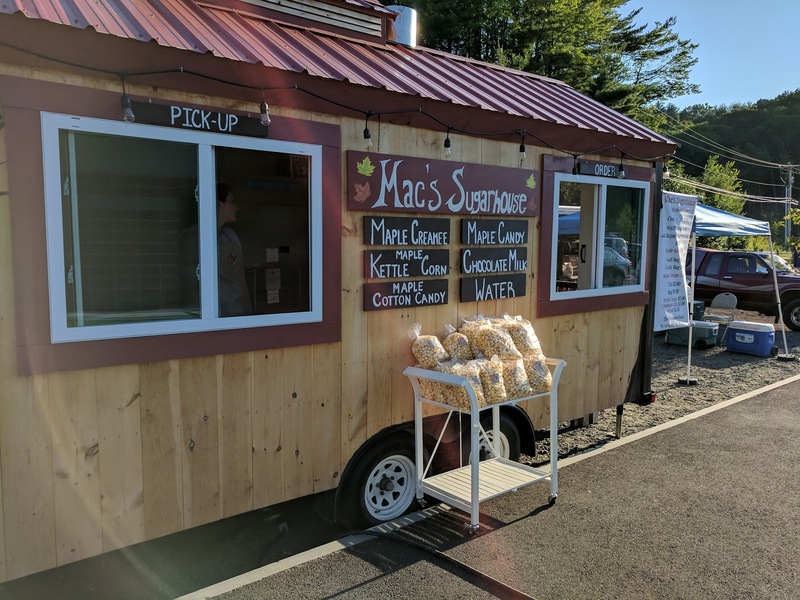 And during the summer, McNamara Dairy and Mac's Maple combine forces to make it. Yes, soft serve, made with local premium dairy and maple syrup. As a soft serve lover, this sounded, well, amazing. I honestly do not understand how it had not crossed my radar before. The soft serve is sold at the dairy farm on weekends only, at a little stand they run, from 10am-5pm on Saturday, 12pm-5pm on Sunday. My mother, who loves ice cream perhaps even more than me, did not know this. She says they really have not publicized it at all. I have no idea how long they have been offering it. The stand also offers many other maple products, including the syrup of course. Once I discovered the existence of this amazing creation, I had to seek it out. The only problem? I couldn't go during those limited hours on weekends. 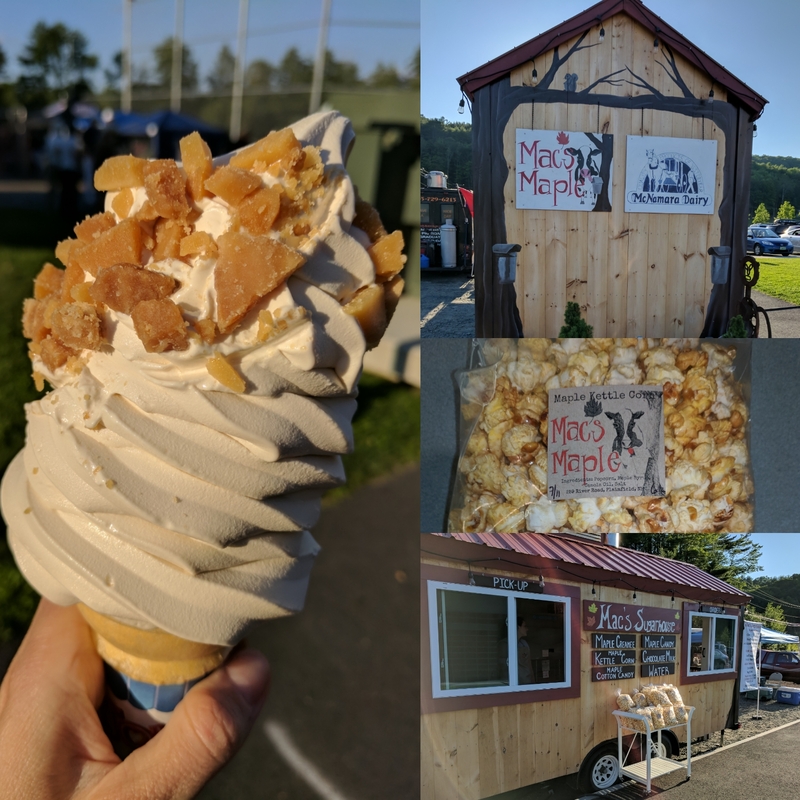 I reached out to Mac's Maple on Facebook (not *really* expecting a response), to find out that they also have a mobile ice cream trailer that they bring to local baseball games. And there was one that night. Bingo. I immediately told my mom we needed to go. To White River Junction Vermont, to, uh, go see our local baseball team play. It would cost $5 to get in, but, maybe we could tell them we were just there for ice cream? We ate a rushed dinner, hoped in the car, and headed to the game. We didn't regret a thing. Side of the Ice Cream Trailer. I spotted the ice cream trailer the moment we pulled into the parking lot. It was adorable. It looked like a mini maple sugar shack! It had signs for both Mac's Maple and McNamara Dairy painted on, and beautiful artwork on the back side. They even had little trees set up around the trailer hitch. The front side featured the ordering window and pick-up window. Seriously, how cute is this thing? Look at the roof! It has a smokestack! 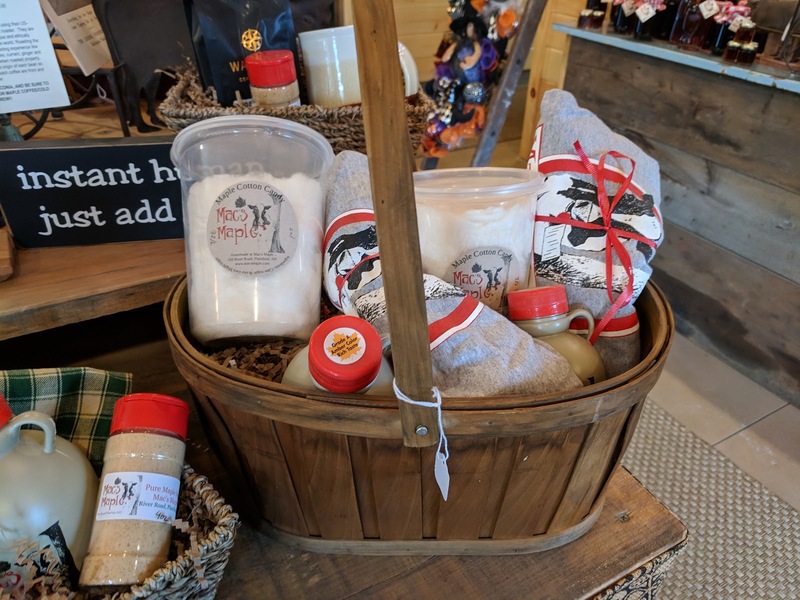 The menu is pretty simple: all the maple products! The only variety of soft serve ice cream, er, creamee, that they sell is maple. They also sell maple candy, maple kettle corn (! ), and maple cotton candy, plus that aforementioned amazing chocolate milk. Maple Creamee + Maple Candy "Sprinkles". $3.00 + $0.50. Soft serve is available in a cup, cone, or sugar cone. I went for regular cone, as I have a very strong belief that soft serve should basically only be eaten from a cone. My mom choose a dish. The ice cream comes in one size only. It was ... really quite generous. It was more than I wanted actually, I would have loved a half-size, kiddie cone, whatever you want to call it, but, alas, no choices. It was large, but very well twirled. There was absolutely no hollow part in the center. The soft serve was great. Very creamy, very smooth. It melted perfectly in the setting sun. The maple flavor was intense, certainly sweet, but not too overpowering. Far better than any other maple flavor ice cream I've ever had, which makes sense, as this was real syrup, and normally they use flavored stuff. You can add what they dub "maple sugar sprinkles" to your creamee, which I did, mostly out of curiosity. I love sprinkles, so, why not maple sugar ones? I didn't quite know what to expect. The answer was little bits of maple sugar candy. Now, these were good. Intensely sweet maple candy. And this is a fun idea. But ... it was way too sweet for me with the maple ice cream. I sadly ended up knocking them off my cone. I think these would be incredible with vanilla ice cream. I'd gladly get it again, although I'd like to split with someone, and, uh, bring my own nuts? "Beautiful maple kettle corn, made fresh for you!" It is no secret that I'm obsessed with popcorn. There is a reason, just like ice cream, I have a whole label on my blog devoted to it. I eat more of this than ice cream, probably. 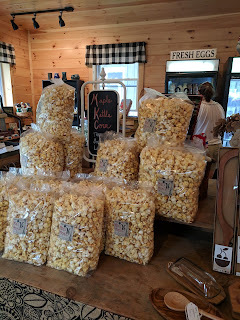 Some kind of popcorn, sweet or savory, is part of my daily snack line up. I have opinions on popcorn. I couldn't resist grabbing a bag of the maple kettle corn alongside my ice cream. I *did* manage to make it all the way home before opening the (sealed) bag, which is probably a good thing, because I would have turned right back around and grabbed the family size bag too. This was very good popcorn. The popcorn itself was light, airy, well popped. No duds in the bag (although, to be honest, I do like the duds too!). The kernels were well coated. There was some variation in the coating levels, just enough to make it impossible to stop eating, in the "oh, i just want one more perfectly coated one" sense, but all had plenty of coating. That coating was maple flavored, sweet, beautiful flavor. Such an extra dimension over regular kettle corn made with white sugar. I imagine they make this with their maple sugar. There was a slight saltiness to offset it. Personally, I prefer a bit more salt, but, still, this was great. Overall, wonderful, and one of very few popcorns I enjoyed just eating out of the bag at room temperature ... normally I freeze my popcorn to make it extra crunchy, and that was not needed here at all. I'll clearly gladly consume more of this!